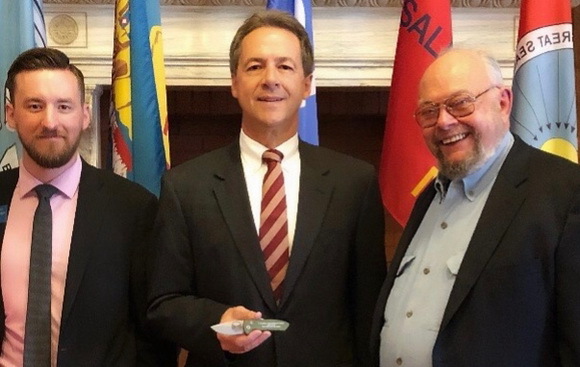 Tuesday afternoon in Helena, Montana Governor Steve Bullock held a signing ceremony for Knife Rights’ Montana Switchblade Ban Repeal and Knife Law Preemption bill, HB 155. Knife Rights Board member Ethan Becker attended representing Knife Rights. 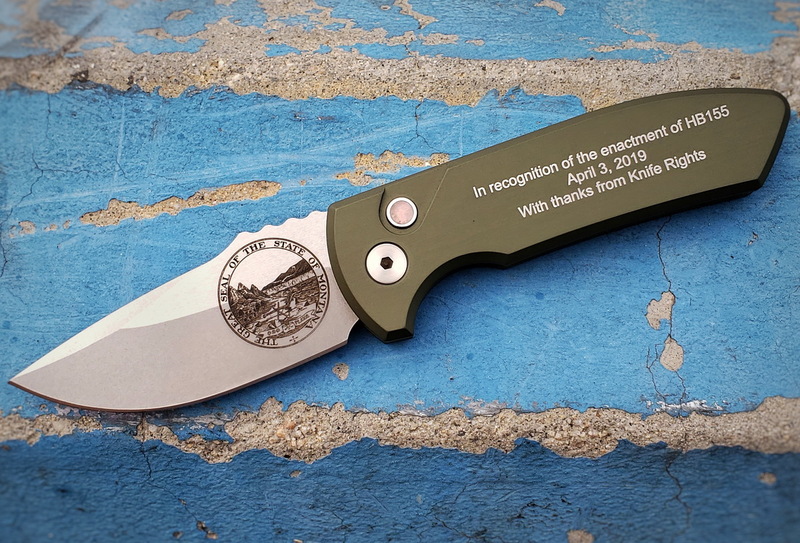 Ethan presented the Governor his first ever automatic knife, a specially inscribed Protech SBR, as an award in recognition of his signing of the bill. Also attending was activist Joe Paschal and ACLU of Montana Director of Advocacy and Policy S.K. Rossi.. Not in attendance was Knife Rights member and activist E.J. Redding, who went the extra mile for knife owners in Montana and played a critical role in this accomplishment. Bill sponsor Rep. Casey Knudsen worked closely with Knife Rights’ Director of Legislative Affairs, Todd Rathner, on HB155, and deserves our gratitude for his significant efforts which resulted in the bill’s passage and the Governor’s signature. All involved also received one of the inscribed Pro-Tech SBRs in recognition of their vital assistance in getting HB155 enacted. With the repeal of the state’s prior restriction on switchblades, automatic knives are now completely legal in Montana. Montana is the 16th state to repeal its ban on switchblade (automatic) knives since Knife Rights started in 2010. With Knife Law Preemption enacted, all existing local knife ordinances more restrictive than state law can no longer be enforced. Montana is the 11th state to enact Knife Law Preemption since Knife Rights’ signature effort started in 2010. This effort follows up on 2017’s repeal of the prohibition against concealed carry without a CCW of “a knife with blade 4 or more inches in length” as well as removing Dirks, Daggers, Sword Canes, razors, “billy” and “knuckles” from the items prohibited from concealed carry. Preemption prevents enforcement of existing local knife ordinances and prohibits new ordinances more restrictive than state law which only serve to confuse or entrap law-abiding citizens traveling within or through the state. Preemption ensures citizens can expect consistent enforcement of state knife laws everywhere in a state. Since 2010 Knife Rights has been Rewriting Knife Law in America™ with 30 bills repealing knife bans enacted in 21 States, forging a Sharper Future for all Americans™. Knife Rights is the one getting it done™ for America’s knife owners and knifemakers. Montana Governor Steve Bullock has signed Knife Rights’ Montana Switchblade Ban Repeal and Knife Law Preemption bill, HB 155. It is effective IMMEDIATELY! We sincerely thank Governor Bullock for signing HB155. Bill sponsor Rep. Casey Knudsen worked closely with Knife Rights’ Director of Legislative Affairs, Todd Rathner, on HB155, and deserves our gratitude for his significant efforts which resulted in the bill’s passage and the Governor’s signature. We sincerely appreciate the support at the legislature from Knife Rights member E.J. Redding and ACLU of Montana Director of Advocacy and Policy S.K. Rossi. We also greatly appreciate the assistance of Montana activist Joe Paschal. Since 2010 Knife Rights has been Rewriting Knife Law in America™ with 30 bills repealing knife bans enacted in 22 States, forging a Sharper Future for all Americans™. Knife Rights is the one getting it done™ for America’s knife owners and knifemakers. The Montana Senate voted unanimously to pass Knife Rights’ Montana Switchblade Ban Repeal and Knife Law Preemption bill, HB 155. HB 155 was earlier passed by the House 99-1. It now goes to Governor Steve Bullock for his consideration. Bill sponsor Rep. Casey Knudsen worked closely with Knife Rights’ Director of Legislative Affairs, Todd Rathner, on HB155, and deserves our gratitude for his significant efforts which resulted in the bill’s passage with but a single nay vote. We sincerely appreciate the support at the legislature from Knife Rights member E.J. Redding and ACLU of Montana Director of Advocacy and Policy S.K. Rossi. Also supporting the bill were the Montana Sheriffs and Peace Officers Association, Montana County Attorneys Association, Montana Association of Counties and Montana League of Cities and Towns. We also appreciate the assistance of Montana activist Joe Paschal. Knife Rights signature Knife Law Preemption effort started with enactment of the nation’s first Knife Law Preemption bill in Arizona in 2010. In total, ten states have now enacted Knife Rights’ Knife Law Preemption bills. If the Montana governor signs this bill, that will make eleven. Since 2010 Knife Rights has been Rewriting Knife Law in America™ with 29 bills repealing knife bans enacted in 21 States, forging a Sharper Future for all Americans™. Knife Rights is the one getting it done™ for America’s knife owners and knifemakers. Knife Rights’ Montana Switchblade Ban Repeal and Knife Law Preemption Bill, HB 155 sponsored by Rep. Casey Knudsen, has passed the Montana House by a nearly unanimous vote of 99 – 1. We would like to thank Montana activist Joe Paschal, Montana Knife Rights supporter E.J. Redding, and ACLU of Montana Director of Advocacy and Policy Director S.K. Rossi for their assistance in getting HB155 passed in the House. HB155 now moves to the Montana Senate for its consideration. Knife Rights will let you know when it is appropriate to contact your senator to ask them to vote YES on HB155. Knife Rights signature Knife Law Preemption effort started with enactment of the nation’s first Knife Law Preemption bill in Arizona in 2010. In total, ten states have now enacted Knife Rights’ Knife Law Preemption bills. At the request of Knife Rights, Montana State Representative Casey Knudsen has introduced HB 155 which would repeal the state’s switchblade ban and enact Knife Law Preemption. Knife Rights will let you know as soon as it is appropriate to contact your legislators about this bill. We would like to thank Montana Knife Rights supporter E.J. Redding for his assistance in getting this bill moving.